The Broads are a net work of mostly navigable rivers and lakes in the counties of Norfolk and Suffolk. There are seven rivers and sixty-three broads mainly in Norfolk and thirteen of the broads are open to navigation with a further three having navigable channels. Some broads have restrictions in autumn and winter. The Broads were man made from the effects of flooding on mediaeval peat excavations. The Romans first dug up the rich peat beds for the use of fuel and then in the Middle Ages local monasteries began to excavate the peat as a turbary business selling fuel to Norwich and Great Yarmouth. Norwich cathedral took 320,000 tonnes of peat a year. When the sea levels began to rise the pits began to flood so wind pumps and dykes were built but to no avail the flooding continued resulting into the landscape and the broads as they are today with its reed beds, grazing marches and wet woodlands. 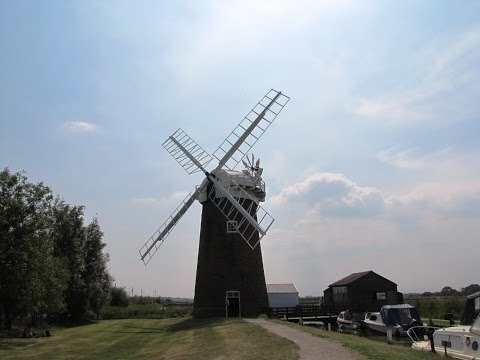 There are still many drainage wind pumps (windmills) to be seen on The Norfolk Broads. Ranworth is a very small village in the Norfolk Broads near Norwich in the county of Norfolk. The Norfolk Wildlife Trust Information Centre at the Malthouse Broad has a car park with disabled parking, a shop with a post office, a cafe, toilets and a pub The Maltsters. It is also a boat mooring site so you can moor up to take a walk, relax or enjoy a drink and a bite to eat. A little further nearer to the village of Ranworth is the boardwalk trail to Ranworth Broad and the Nature Reserve and Broads Wildlife Trust which is suitable for wheelchairs and pushchairs. The floating visitors centre, at the end of the boardwalk, has binoculars upstairs providing excellent views of the open water and the wildlife surrounding it, there are also some picnic tables. There is lots of wildlife, wildfowl, insects, butterflies, wildflowers and trees making Ranworth a relaxing, peaceful and wonderful place to visit. For such a small village Ranworth has a large and beautiful 15th century church often called the Cathedral of the Broads. St. Helen’s Church with its 100 ft tower and treasures can be seen for miles around the Broads. As you enter the church you will see the font in front of you and to the left hand side there are the steps, to the top of the tower. There are 89 steps and two ladders to climb and for a donation of £2 each it is well worth the narrow steep climb to the top to admire the wonderful views. At the right hand side of the church there is a tearoom and toilets. Horning is an ancient village situated on the northern bank of the River Bure and south of the River Thurne hence the name Horning meaning the “folk who live on the high ground between the rivers”. Horning located in The Broads National Park is a very popular tourist destination having attractions in and around the village. One attraction being sailing and motor boating and the Horning Sailing Club hosts regular annual events. Boat hire is available from various places around Horning and the River Bure is navigable from here to the North Sea at Great Yarmouth. In the surrounding area there are many waterside properties, pubs, shops, tearooms, restaurants, boat trips, and much more whilst the centre of Horning consists of a single street, a village green, a pub and a few shops including a post office and a butcher. The Swan Inn at the end of the village was built in the early 19th century but dates back to 1696 and just outside Horning there are two more pubs The New Inn and The Ferry Inn. To get from one side to the other side of the River Bure there is a foot ferry service which also carries cyclists and pets. The ferry is operated by Freedom Cruisers down Ferry Lane on the northern bank, just go and ask. If you wish to cross from the south bank to the north bank then a phone call is required as the service now runs to demand rather like a taxi. We park at the Norfolk Wildlife Trust Information Centre in Ranworth. We amble around the centre and take a look at Malthouse Broad before we turn right out of the car park opposite the Maltsters pub. We walk down the road for a short way then take the road on the right again after a short way we take the boardwalk on the right to the Ranworth Broad and the visitors centre. We spend some time here then head back to the road turning right. We follow the road round until we arrive at St. Helen’s Church. We go inside and climb up the steep steps of the church tower to take a look at the views. On leaving the church we turn right along the road following the sign towards Woodbastwick. We pass a road going off to the left and keep following the road. We then take a no through road on the right signposted River Only. We head forward. At the River Bure we asked someone if they could take us to the other side because we could not get a signal on my mobile to be able to ring for the ferry. At the other side we walk on the track to the road and turn left. We follow the road up into the village of Horning and then enjoy our time wandering about and watching the sailing boats. We make our way to The Swan Inn before we start to make our way back. We pass The New Inn on our right and take the next turn right down Ferry Lane to Freedom Cruises where we catch the ferry to take us back to the other side of the river, this only takes about five minutes. At the other side we retrace our steps until we reach the church. Here instead of turning left we head straight forward back to the Information Centre car park where we started. This is a mainly easy, flat walk. The only height to climb is the tower in St. Marys which is optional. The walk from the information centre at Ranworth to the River Bure and the boardwalk to Ranworth Broad Visitors Centre are suitable for wheelchair users. Approx 7.25 miles using OS map OL40. The Norfolk Wildlife Trust Information Centre at Ranworth in the Norfolk Broads. Take the A47 between Great Yarmouth and Norwich and take the B1140 north then take the second road on the right to South Walsham. After the pub and post office, take the left turn onto Ranworth Road which takes you to Ranworth. There are public toilets at Ranworth in the car park next to The Maltsters pub and at St. Helens Church. There are also toilets at the top end of the village of Horning in the coach and car park near the Swan Inn. For refreshments in Ranworth there is a cafe, a shop with a post office, a pub and a tearoom next to St. Helens Church and in Horning there is a variety of shops and three pubs.